Clensure RC Facial Cleanser, Should You Get One? Though it may not be one of the slimmest facial cleansers available, the Clensure RC facial cleanser is a breath of fresh air with its L-shape design. As advertised, this shape is part of its ergonomic design for a better and more comfortable grip. 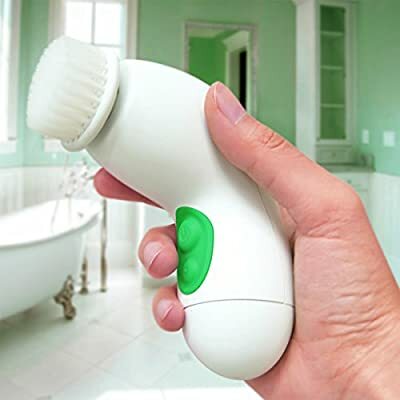 Powered by batteries, this facial cleanser has excellent portability for hassle-free traveling. It’s safe to use on a daily basis for all skin types. Here, we give you a report of this device. Is it worth it? Read on to find out. The Clensure RC cleansing brush is not equipped with sonic technology. It is a 2-speed rotating electric brush that comes with a high and low setting. On the handle, there are two buttons – one for power (on/off) and another for speed control. To switch speeds, simply press the lower button. When you unbox your package, expect the following contents: Device, Brush Head, Sponge Head, AA Batteries(2), Instruction Manual. As you can see, this device comes with two brush heads – a brush and a sponge. They are designed to deep cleanse, exfoliate, and massage your face. The promised benefits include cleaner and younger-looking skin, and removal of blackheads and sebum. It’s made in Korea. This is refreshing especially that most of the facial brushes on the market are manufactured in China. It comes with a replacement brush that you can puchase separately. It requires two AA batteries to operate. Nodea USA has a video explaining the brush heads of the Clensure RC. There’s also a demo on how to use it. We’ve visited a popular online retailer, and here’s a summary of what previous buyers say about their Clensure RC. Several buyers have observed an improvement in their pimple / acne situation. After regular use of the device, the breakouts and blackheads are either minimized or eliminated completely. As for its cleansing action, users say that this device can remove makeup completely and leaves skin smooth and very clean. How does it compare with the Clarisonic? First, there is no doubt that this product is cheaper than the Clarisonic or the Foreo Luna. So for people who are looking for a cheaper alternative, check out the Clensure RC facial cleansing brush . As for power source, the Clensure RC wins because of two reasons. First, batteries are easy to travel with. They come in standard sizes, so replacing them is easy even though you’re out of the country. Second, charging stations can break. If this happens, you may not be able to use your cleansing brush until you find a new charger. As for size, the Clensure RC is smaller, so it’s easier to pack and store. When it comes to movement of the brush heads, the Clensure RC’s brush heads move in a circular motion. The Clarisonic brush heads, on the other hand, vibrate or pulsate. From what we can make out from the consumer feedback, the Clensure RC deep-cleanses as it promises to do. It’s effective in removing makeup, and it can help deal with one’s acne or pimples. But while it appears to help you improve the quality of your skin, Clarisonic is still way ahead. Overall though, the Clensure RC is good for people who don’t want to spend more than $100 for a facial brush. Should You Get ReMEDies’ Home Spa Premium Rejuvenator?